Is a One-Piece Toilet a Good Fit for You? Sleek designs, easy-to-clean exteriors and small-space-friendly features are just three reasons why today’s homeowners are becoming more interested in one-piece toilets. According to Miller, the seamless transition between the base and the tank has another advantage: easy cleaning. Mansfield Plumbing offers one-piece toilets in the Aegean style featuring an elongated front toilet bowl and a color-match SmartClose toilet seat. The Aegean model 705NS features a 1.6Gpf/6.0 lpf low water consumption while the Aegean ADA model 708 has 1.28 Gpf /4.86 lpf low water consumption. 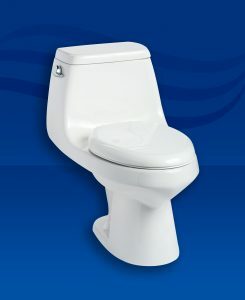 The Aegean ADA also has a 16-5/8 inches high SmartHeight bowl for easy access and maximum comfort.